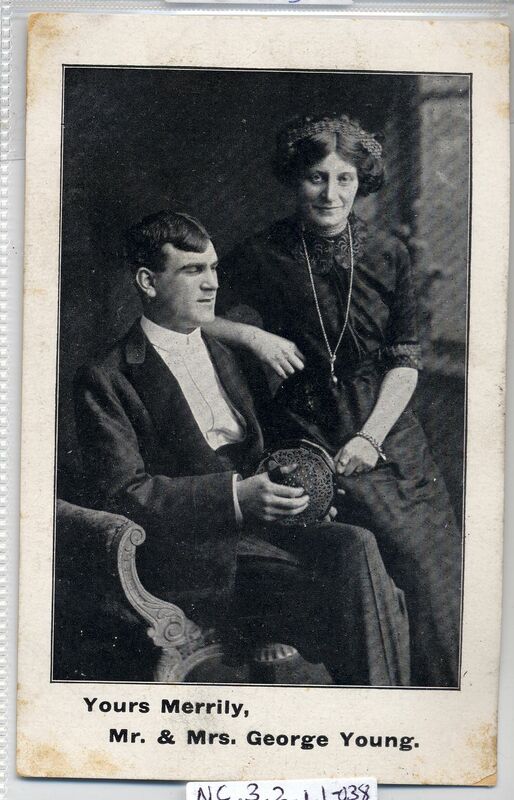 A black and white postcard of the blind concertina player George Young, together with Mrs Young. Postally unused, "Hines, Printer, Sunderland".� The Museum Collection includes a selection of publicity cards, adverts and postcards of "George Young, Blind Musician". The card catalogued here is the first known with Mrs Young appearing on it, and George holds his Lachenal Edeophone metal-ended English concertina. In most cards, he is seated on a turned-wood chair holding a Lachenal Edeophone metal-ended English concertina, with a 48-key metal-ended English concertina on a nearby pot-stand. See Items NC.3.2.1.1-008 , NC.3.2.1.1-009 ,� NC.3.2.1.1-010 ,� NC.3.2.1.1-011 and also NC.3.2.1.1-012 where George appears as a young Boy Scout! One card, however, NC.3.2.1.1-029 � has just the image of the man on the George Young cards, but with the differently-named caption "Yours Merrily - Geo Leonard"!! The reason for this change of name is not known.